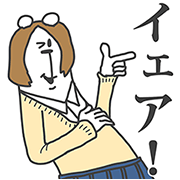 http://www.line-stickers.com/ – Rinna and the Annoying Bear Line Sticker | Microsoft’s emotionally sensitive A.I. Rinna has teamed up with the most annoying bear in the forest to bring you a special set of high school stickers! Have fun annoying your friends with these hilarious stickers. Friend Rinna’s official account to get this set for free. Available till November 5, 2015.